Home Baby Health What To Do About Baby Chewing On Crib? Every mom has been there, and if you haven’t, you probably will in the future. You come in after your child has been napping to find the baby chewing on crib railings and paint chips all over their face. Your first reaction is probably one of panic, and like most other moms, you have a reason to be nervous. In this article, we will look at several reasons why babies might chew on their crib, whether it is dangerous to their health, and what you can do to help prevent it from happening or happening again. Here is what you should note. Why Do Babies Chew on the Crib? How to Keep Baby From Chewing on Crib Rails? While there can be several answers to the question of why do babies chew on cribs, the most common reason that a child chews on the crib railings is due to teething. When your baby is going through this natural developmental stage, they often get gums that are irritated and sore. One way a baby relieves the soreness in their teeth gums is by chewing on things. In some cases, chewing on things can mean chewing on the railings of their crib as well as toys, pillows, and any other object that might feel good to their teeth. Unfortunately, there is not much you can do for a baby while they are teething except give them remedies for sore gums like vanilla extract or chilled chewing toys. However, there are several things you can do to prevent them from chewing on their crib. We will discuss several of these preventative methods for crib chewing a little later. Baby Chewing On Crib, Is it Dangerous? 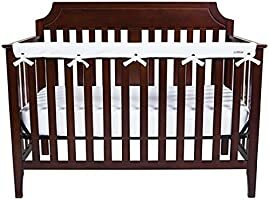 The question of can baby get sick from chewing on crib railings is a tough one, especially since every parent will have a different crib type for their baby. Perhaps the best way to ensure that your child doesn’t get sick from chewing is looking into the preventative measures below. Otherwise, chewing on raw wood is not as likely to cause sickness in your child. Sadly, most cribs are either painted or stained with a wood stain that can be harmful to anyone when ingested, even if it is dry. This is why most people choose to avoid the chewing in the first place. Since paints and stains can contain toxins for the body, people have gone as far as not staining their crib or painting the wood but leaving it raw. If you have a raw wood crib, your baby might not be as likely to get sick from chewing. However, you should monitor them to ensure that they do not bite off chunks of wood which can be harmful to the baby. Another way to prevent a baby from getting sick when chewing is painting the crib with a safe baby paint. Many hardware stores sell this type of paint that is made with natural ingredients and avoids chemical toxins that might be harmful to the baby. However, you should always try to prevent the baby from chewing off the paint. Luckily, there are several ways you can prevent your baby chewing on crib railings, answering the ultimate question of how to keep baby from chewing on crib railings. These methods are easy and useful ways to give your child something to chew on that keeps them safe in the process. Just remember that the teething will pass, and the chewing on crib railings should pass along with it after the discomfort of teething is gone. First, you can always try giving them an alternative. Though this isn’t the most effective method, giving a baby a wooden spoon or another item that is rather hard to chew on can help relieve their sore gums and distract them from chewing on the railings of the crib. Some people prefer teething toys like teething rings. Others prefer frozen treats that are cold enough to help reduce the pain but not cause the baby harm. Whether by natural or toy means, giving the child a distraction can help, especially if the chewing is not common. Another option is to make homemade rail covers by using the old bumpers from the crib. Some moms like the ability to take their crib bumpers, tie them to the railings, and keep their babies from chewing. Not only does this save them money, but it is also easy to simply pull the bumpers back down whenever the baby gets through the teething phase. Plus, the bumpers can always be reused, giving you more bang for your buck. The video below can give you an idea about the process of creating your DIY rail cover. Finally, the most tried and true method of crib chewing preventative is the railing covers. Most people choose to purchase a finished railing cover from a website or shop, and while these are great options, there are other people who choose to make their railing covers. Railing covers are typically made from fabric, though some are made with a gel-like material that feels soft to the baby’s teeth and gums. If you choose to make your railing cover, you will need a soft fabric with some sort of cushion inside. Luckily, there are patterns for making your railing covers everywhere. 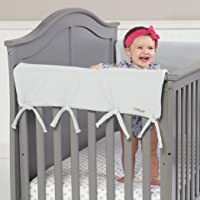 There are various types of railing covers that range from the gel bumpers, mentioned earlier, to some with Velcro attached to put toys or teething rings for your baby. These are similar to a distraction for your baby, which helps prevent them from chewing on the railing. If they still insist on railing chewing, you can be confident that the cover will prevent them from eating paint, stain, or the wood chips. If you choose the buy option I suggest to you the 3 top rated rail covers just below. It should come as no surprise that teething is uncomfortable. In fact, most babies end up slightly sick during their teething time, and you might find that they will chew on anything. In some cases, the chewing can result in chewing on the railing of their crib. If you find your baby chewing on crib railings or other parts of their crib, there is no need to panic. However, you do need to take action. Since the crib can be stained wood or painted wood, it is never a good idea to let your baby chew on the railings should they scrape off chips or pieces, get them in their mouth, and ingest them. In most cases, chewing once will not hurt your baby, but if you find them repeatedly chewing on the crib railings, you will need to take preventative measures. Things, like providing distraction, using the crib bumpers, or even getting a railing cover, can be a great way to keep them from chewing will also keeping them occupied at the same time. This is especially true since most railing covers come with toy attachments for teething rings or other options. When it comes to keeping your baby safe, mothers are going to do everything they can to prevent their baby from harm, especially ingesting a harmful substance. Remember that teething is the main cause of chewing, and once the discomfort eases, the chewing will ease as well. The answer to the question of why do babies chew on cribs is not always an easy one, but it is part of their normal growth and development. As they get older, you can rest assured that crib chewing should cease. Video & Photos credits: Amazon, Whitney Sews.